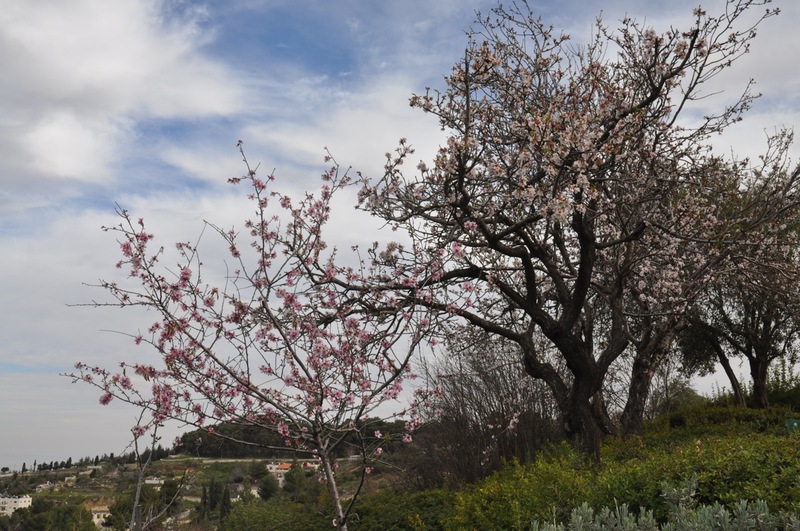 With the advent of Tu Bish’vat, the new year of trees next Thursday, I am happy to present this excerpt from The Natural Bible by Baruch Sienna about trees and the almond tree that is the harbinger of spring in Israel. From the very first trees planted at creation and the Garden of Eden, to the trees worshipped by King Ahaz in the final chapters of the Bible, trees figure prominently in Jewish literature and lore. The Hebrew word for tree appears over 150 times in the Bible, and more than 100 different kinds of trees, shrubs and plants are named. The Mishnah adds hundreds of names of plants; Masechet Zera’im in particular deals with laws of agriculture. Midrashim, too, often use plants in similes and parables. In all, over 500 different plants are mentioned in classical Jewish sources. The Bible is rich in natural imagery, metaphors and parables. Often, our understanding of the biblical text is impoverished because we no longer appreciate their meaning. Trees and plants were important in the ancient world. Trees furnished wood for construction of buildings, boats, furniture and smaller articles. Many trees provided nutritious and tasty fruit. Grains and vegetables were cultivated and wild plants were gathered. Other plants were used for food, medicinal purposes, herbs and spices, incense important for use in sacrifices, rope and cloth fibers. Sap and oils were extracted from plants and trees. Today, many of us live much farther removed from the natural world than did our biblical ancestors who lived and worked outdoors for much of their lives. It is only natural that the Bible used images of the great outdoors that surrounded them. While the Bible uses images and descriptions of plants and trees, it is not meant to be a botanical encyclopedia. The Bible often mentions plants and trees incidentally; the names and descriptions of plant and animal life are not systematic. Some plants, such as ebony, pistachio, and walnut, are mentioned by chance, appearing just once in the whole Bible, while even many common species of plants, such as the caper and carob, are not mentioned at all. Trees are the tallest and longest living plants on the earth. It is difficult not to be inspired by an enormous tree, whose roots are in the earth, yet whose branches seem to touch the very sky. Trees typically survive for several human generations, and their longevity must have also impressed the ancient Israelites. It is not surprising that trees were powerful symbols for the ancient Israelite, and many significant trees are featured in biblical stories. The terms conifer and broadleaf are used to describe the trees included in this tree guide. While conifers are typically evergreen, the two terms are not synonymous even though they are often commonly and incorrectly used interchangeably. A conifer has needlelike or scalelike leaves, and usually produces its seeds in a woody cone-like fruit (although the juniper fruit, being the exception that proves the rule, resembles a berry). Broadleaves are often deciduous (meaning they lose their leaves), but again, many broadleaves, especially living in Israel’s climate, are also evergreen. Broadleaves produce diverse types of edible and inedible fruit: berries, fleshy fruits, as well as nuts. The palm “tree” is a special case. Palms seem very tree-like but are not actually true trees. Palms have a single unbranched stem that does not increase in girth with age. The difference is apparent when a palm is cut down — the trunk is not woody, and the stump does not have the rings of growth we normally see in an actual tree. The majority of biblical plants have been identified, though occasionally differing identifications and interpretations have been suggested. As a result, the identity of some biblical flora is speculative. The Bible does not include a full botanical description, and it is even possible that the plant referred to in the Bible may no longer grow in Israel or at all. Some plant names in the Bible are very specific and some names refer to a more generic category. So, kotz for example, refers to thorns in general. The word erez can be both: it usually refers to the cedar but sometimes is used to mean non-fruit bearing conifer trees in general. Descriptions in classical rabbinic sources as well as other ancient translations and early historical writings are helpful in identifying biblical flora. Often, a plant’s name has been preserved in its Aramaic or Arabic form. Biblical scholars assume that there have been no major changes in the geology or climate of the region, so trees that are described as growing in a particular region presumably might still be found there. This may not always be ​the case for trees which have been over-harvested, for example. Conversely, many exotic species have been introduced into Israel’s flora, such as the native Australian eucalyptus tree. These were planted extensively during the early 1900s to drain potential mosquito breeding grounds, to provide shade, and to serve as a natural camouflage for military installations and road convoys. Furthermore, languages change over time. Occasionally, a Hebrew name is used in modern Hebrew to refer to a different plant than was meant in the Bible. Asking for botnim today in Israel will buy you peanuts; in the Bible the word refers to pistachios. The biblical Hebrew word kishu-im is now used in Israel to refer to the zucchini squash, and not cucumbers. To identify the cucumbers mentioned by the Israelites who left Egypt, we must search for a species that grew in Egypt in the period of the Israelite wanderings, and not with the species that flourish today. Translations may not reflect the latest botanical understanding and are not always reliable. For example, it is now generally agreed that the biblical brosh refers to the juniper, although it is usually translated as cypress, which has become its modern day meaning as well. Finally, some plants such as the ‘ar ‘ar and the tirzah, many animals and birds, and names of precious stones and gems cannot be identified with any certainty at all, and translations are at best a guess. What follows in the Natural Bible is a comprehensive guide to the plants mentioned in the Bible. From this guide, I have chosen one tree, the almond, a symbol of springtime in Israel and associated with Tu BiSh’vat as its flowers usually appear in the month of Sh’vat – while guiding up on the mountain ridge at Belvoir I saw the first almond blossoms in January, the day before Rosh Hodesh Sh’vat. Although the common word for almond is sha-keid, the word luz appears once in Genesis 30:37 (where it is erroneously identified as hazelnut by Rashi). The word luz is similar to the Arabic and Aramaic word for almond: luza. Put in your baggage the land’s best products and take them to the man as gifts — some balm, a little honey, gum, ladanum, pistachios and almonds” (Genesis 43:11). Almond trees produce pink or white five-petalled blossoms. Both wild (bitter) and domestic varieties of almonds grow in Israel. The wild variety can be eaten with the rind when young, but in its later stages requires roasting to destroy poisonous alkaloids. Cultivated almond trees of the early 20th century were attacked by the borer beetle, and almost all the orchards were destroyed. In the 1960s, almond cultivation resumed in Israel. Excerpt From: “The Natural Bible” Baruch Sienna, Behrman House, 2013. What Tree is the Sycamine? This entry was posted in Nature and tagged almond, tree, tu bishvat on January 9, 2014 by Shmuel Browns.